VTS engineers, taking advantage of their experience gained over the years of manufacturing and operating, have developed a new, innovative design of the WING curtain, which combines both functional and aesthetic qualities as well as meets the current requirements for acoustics and energy saving. The quietest curtain currently available on the market will be now available on UAE market. Owing to special solutions reducing air flow resistance and application of EC motors as well as a precisely developed rotor and air structuring device blades, the electricity consumption has been successfully reduced along with obtaining the required air stream range and the outstandingly short start-up time to full performance. The innovative and aesthetic shape of the WING curtain complements its unrivalled perfection. Due to the quality of applied solutions, a lifetime warranty on the housing and a five-year warranty on the final product can be granted. Air Curtain WING from VTS, which has been the leading global manufacturer of air curtains for years, redefines the air curtains category, providing investors with a product whose design meets the latest trends and whose parameters are suited for every interior. The entry zone in contemporary construction has not only functional, but also representative importance. The aesthetics of the interior and the comfort of persons present in the entrance hall of the modern office building, bank, apartment block, office or other public utility facility are one of the most important features of this part of the building. A major issue of the entry zone is the external doors which are opened frequently, thus causing energy losses and drafts which bother the persons present inside. The vestibules which have been used for years eliminate these inconveniences, but they are not popular among the architects, since they prevent the architects from using this visiting space in an optimum manner. Air curtains are an alternative for vestibules that complies with good practice and applicable legal provisions. However, they should also math the representative character of the space in which they are installed, apart from providing effective reduction of heat exchange through open doors and low exploitation costs expected by the user. Thus the aesthetic values and silent operation (apart from effectiveness of operation and power efficiency) are the most important features of these devices that are an important element of technical and aesthetic fitting of a contemporary building. Air curtains reduce air exchange through the open external doors, thus protecting the interiors of the building against the inflow of cold air in the winter and hot air in the summer, as well as the entry of insects and contamination. The principle of operation is simple. The curtain within the whole door or gate surface creates an intensive air stream, which is directed vertically or horizontally, tangentially in relation to the surface air of the door opening. Today the greatest advantage in the scope of functionality, aesthetics and power efficiency is offered by innovation. The design is one of the best tools for providing innovative solutions that place the users’ needs in the centre. 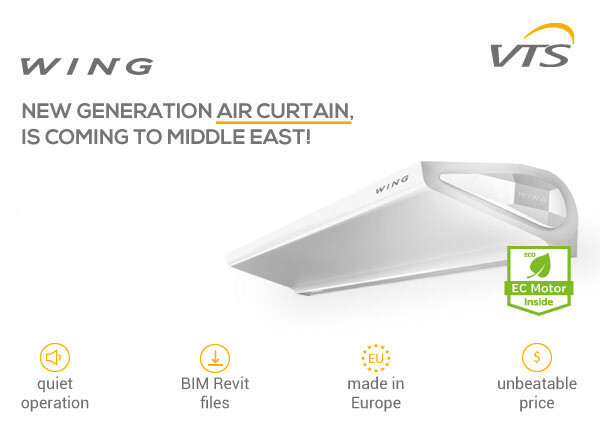 WING air curtain was created from passion for design and on the basis of a dream to achieve exceptional results; it combines an unpretentious form and master execution. Streamlined WING topped up with the side cover with a diamond shape which is nearly invisible is the fruit of the engineering idea, which led to designing the device structure in a manner that ensures subtlety that ideally matches any interiors in functional and aesthetic terms. Transforming ideas of a designer into reality has resulted in a product which is a real luxury on the mass market, due to its unique concept. Having smart form, it is characterized by intuitive operation and easy installation. In order to obtain a required efficiency of an air curtain, it should cover the entire door opening area. The WING curtains are available in lengths of 100, 150 and 200 cm. In the case of larger openings, more than one of the curtains next to each other should be used. All WING curtain are suitable for vertical and horizontal installation, both individually and as a group. 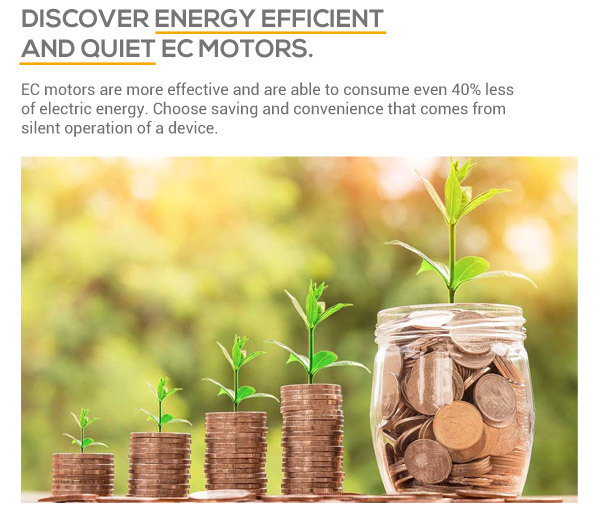 EC motors in combination with the modern fan design in WING curtain ensure up to 40% of electric energy saving, when compared with traditional solutions. The representative character of the entrance zone of contemporary building imposes high and strict requirements onto all the elements mounted on it. 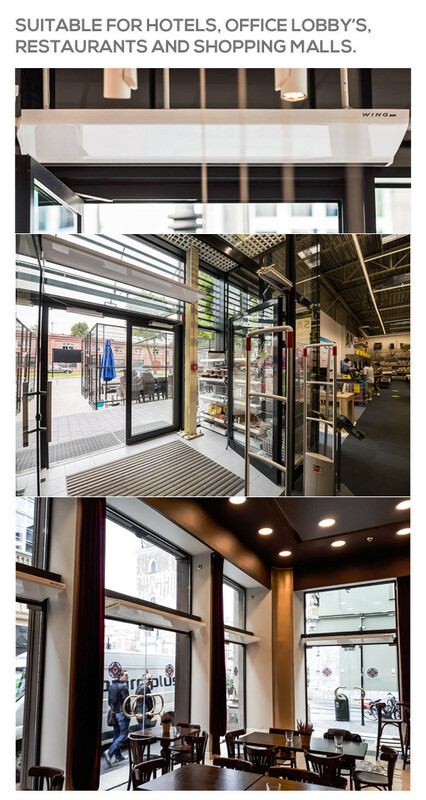 The air curtains, mounted in the entrance zone, should – beside functional performance – meet high aesthetic standards and be characterised by low noise emission. The significant features of modern machinery include energy cost-effectiveness, i.e. a minimal energy consumption at required operational parameters, as well as a possibility of dynamic support of the room air-condition system, started automatically when needs occur. All these criteria are fulfilled by the WING EC curtain of VTS, offering – at a very attractive price – the standard which has, so far, been reserved for premium class devices only. A still better effect of electric energy saving, as well as of heat and cooling saving, can be achieved when the fan is activated only when the door is open. However, technical solutions are needed that enable the start-up of the device with full capacity in a fraction of a second upon door opening. It is possible with the special design of the fan rotor, made of composite materials, which, despite its high performance levels, is characterised by an exceptionally low moment of inertia. The activation of this function in WING EC curtains is carried out by an additionally mounted open door sensor, combined with the Wing EC controller. > support of BMS systems. 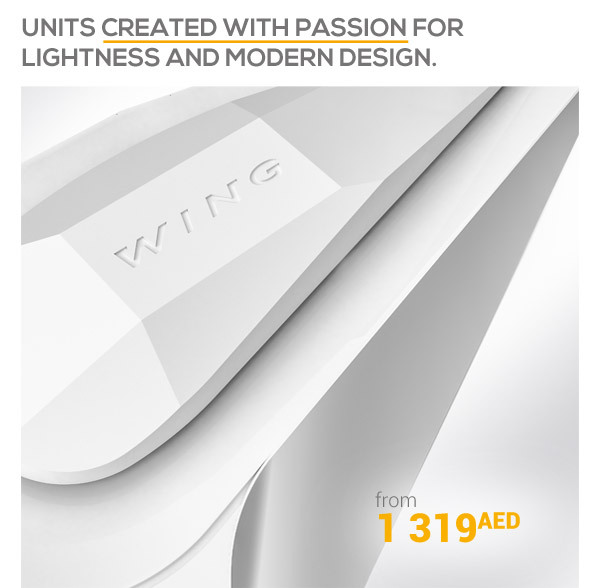 WING is a new generation device, created because of a passion for the distinguished form and technological advancement- which are characteristic for gliders. A minimalist housing with a streamlined form of a wing seems to float in the air. The housing topped up with a diamond that hides excellent components in an innovative curtain body sets new standards for the category of curtains. WING combines unique design and excellent efficiency and therefore it completely redefines the air curtain image.